We take great pride in the work we do, bottom line. And we know that home and business owners take pride in their properties, too. Our goal is to provide a service that simplifies your life and keeps the love and pride for your property as high as possible. What’s best about our service is the flexibility we offer. We allow the customer to decide what he or she needs most. Then we develop our service program to exceed those expectations. Unlike some other lawn care companies, we are willing to customize our services to provide exactly what you have in mind. You want your grass cut a certain length, no problem, as long as we can determine if the length you desire will not harm the lawn. 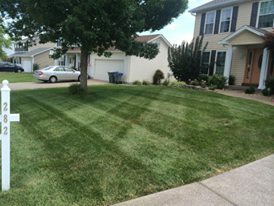 You want your grass cut in a special style, patterns, alternating directions and lines – we are happy to do that! We are even able to adjust the day you want your grass cut upon your request, if necessary. We want our customers laws to be the best looking lawns on their blocks. We want you to hear compliments from your neighbors about how healthy and beautiful your grass and landscaping look week after week. And we will always provide advice, tips and tricks to maintain the quality of your grass while we are between appointments. Here are some of the basic packages we offer, which can be customized to your needs. Pick Your Services – Beyond Mowing, We Provide Edging, Bush & Shrub Trimming, Aerating, Dethatching, Fertilizing, Landscaping, Mulching & More! Don’t say we never gave you anything for free! All kidding aside, there are some great ways to ensure your lawn is in a great, healthy place going into the spring and summer months. Here are a few tips and tricks to get you started. Pro Tip Number 1: Spring is dandelion season. Most people hate these invasive flowers covering their beautiful grass. What is happening when you have a dandelion outbreak is that your PH levels of your soil are too high. Dandelions love a PH of 7.5 or higher. Grass likes things to be more in the 6 to 6.5 range. If you have dandelions, you know your PH is high, so applying aluminum sulfate to the lawn will effectively decrease your PH levels and alter the soil atmosphere, rendering it impossible for dandelions to survive. If you don’t have time to dedicate to this, we can help. We will be more than happy to perform a soil test and treat your lawn accordingly so you will have healthy grass throughout spring, summer and fall. Pro Tip Number 2: Another common misconception we hear from our St. Charles & O’Fallon customers is this: “Cutting the grass really short enables me to go longer without cutting.” This is just not factual information. In fact, it goes against science. Cutting the grass too short actually puts the plant in a panic mode. Grass, like all plants, use photosynthesis (the process of converting sunlight to sugars to feed the roots), to stay alive and healthy. When you cut the blades of grass too short, they cannot collect sunlight to undergo photosynthesis, so one of two things happens. Either your grass will grow back at a faster rate to replenish the blades and keep photosynthesis alive, which goes against the original intention, or your lawn simply dies, turns brown, becomes a breeding ground for weeds and becomes the eyesore of the neighborhood, which you don’t want at all! We will always ensure we cut the lawn to a proper height to prevent either one of these extreme scenarios from happening.